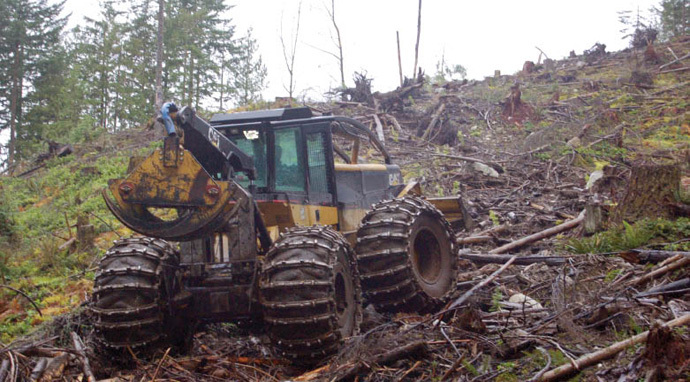 The District of Mission, B.C.’s Forestry Department recently installed Olofsfors Eco-Wheel Tracks on its Cat 525 grapple skidder, and the tracks have been steadily delivering exceptional traction in some extremely steep west coast ground. The District of Mission, B.C.’s Forestry Department had one of those classic equipment choices: equipment was wearing out and it was time for replacing it. 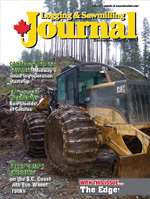 The choice they would make would literally give the district’s logging operation traction. They run a Cat 525 grapple skidder, and the chains were worn out. They put chains with an aggressive diamond pattern on all four tires several years ago—and they had down their work, and were just plain worn down. And as Brad Laughlin, the District of Mission’s forestry foreman explains, they were looking at options. And one of the options was Olofsfors ECO-Wheel Tracks. “We did some research, talked with some people who used them and found out more about these ECO-Wheel Tracks,” says Laughlin. “Based on the information we received, the ECO-Wheel Tracks offered three times the wear, better traction and tire life gets extended because ECO-Wheel Tracks are very static on the tire—they don’t move like chains do. That was about eight months ago, and the move continues to pay off for the District of Mission. Since the logging operation of the District of Mission is working in second growth wood, there is a large amount of debris on the ground from previous logging, making for slippery conditions. It can be tough to get wood out on the steep slopes, but the Eco-Wheel Tracks have performed well, delivering good traction to the Cat 525 grapple skidder. The District of Mission’s Forestry Department, overseen by forestry manager Bob O’Neal, manages Tree Farm Licence 26, also known as the Mission Municipal Forest. TFL 26 is approximately 10,000 hectares of which about 12 per cent is municipally owned and 88 per cent is provincial Crown land. Major forestry programs are carried out by the department including harvesting, tree planting, cone and seed collection, plantation brushing, tree spacing, tree pruning, road construction, forest fire prevention and trail building. With the moderate B.C. coastal climate, the equipment does not have to run on snow or ice very often. “Our major thing here is slippery mud and wood, and wood is disastrous against bare rubber tires,” says Laughlin. So getting good traction with their 525 skidder is essential. They serviced the chains four times—it was quite labour intensive, taking about a day per chain, or four days for the complete set. “It was a lot of work, but that would extend their life. Some operations would just run the chains and then chuck them, but we wanted to extend their life,” said Laughlin. So the search started. In addition to checking out the ECO-Wheel Tracks on the company’s web site, Laughlin and Kocsis talked with a Prince George-area contractor who was working with the tracks, who reported good results. 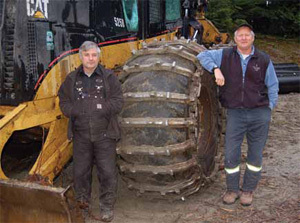 Brad Laughlin, the District of Mission’s forestry foreman (right) and skidder operator George Kocsis with their Olofsfors Eco-Wheel Tracks equipped Cat 525 grapple skidder. The ECO-Wheel Track design, with its high linkage system, significantly reduces rolling resistance compared with conventional tracks, says Olofsfors. Its extended cross members produce less ground pressure and damage, and increases the carrying capacity of equipment, according to the company. Other benefits can include lower energy consumption and reduced wear and tear on a machine and tires. And so far, the benefits keep coming for the District of Mission. Kocsis says even eight months into operation, he is still able to get additional benefits from the ECO-Wheel Tracks. “It’s still giving me stuff,” he says. “With the mechanized falling we do, and this has nothing to do with the operator, we get stuck with high stumps. And we have a pretty low slung skidder, so it’s pretty easy to high centre the machine. Though they have not been quantified, the ECO-Wheel Tracks have made the Cat 525, already a solid skidder, even more productive. “The Cat 325 excavator works pretty closely with the skidder, making trails in soft ground. With the skidder in chains, the 325 would typically throw in broken wood, broken stumps, small logs, material like that, to help get the skidder through. One slight limitation is that the ECO-Wheel Tracks don’t like travelling fast on roads. The operators at Mission don’t have to travel much on road, though, and when they do, they’ll only take the skidder up to third or fourth gear. Laughlin says the ECO-Wheel Tracks have also saved them money. If they had opted for another set of chains, they would have been looking at buying another set of skidder tires, which would have come in upwards of $16,000. But they were able to install the ECO-Wheel Tracks on their existing tires. Even with chains, the tough trails took their toll. Both Laughlin and Kocsis emphasized that the ECO-Wheel Tracks have to be installed properly and carefully. “If the tracks are run loose, they do move. We deflated the tires, installed the tracks on very tight and then inflated the tires. They don’t move.” They added that links may have to be taken out to lengthen or shorten the tracks. Kocsis said the wheel tracks come with fairly good welding instructions. He noted they had to look around a bit to find an electrode that was compatible with the alloy in the ECO-Wheel Tracks, but that was something the shop was able to do easily. Depending on the skidder, the tracks can take up a fair bit of space. The Cat 525 has aprons on the back that were pushed in a bit with the wheel tracks, so they cut the aprons off. They also found that the front end was kind of funny, because the axle tilts and the tracks were hitting the tin work on the skidder. Their solution was to reverse the front rims, and they are now out a further inch, which has also improved stability. There are some operating recommendations and general maintenance to follow when using wheel tracks, says Olofsfors. First is to keep the tracks as tight as possible at all times to minimize the “flexing” of the linkage system. This will ensure maximum life. Next, the differential locks are not required with good traction and should be disengaged under normal operating conditions. Only use dif locks when absolutely necessary. When welding replacement cleats, it’s important to follow the instructions. Never weld additional cleats in the middle of the cross members and spread the heat evenly throughout the track. They had noticed small signs of wear from travelling on the road, so they had the tips hard-surfaced. “This isn’t really necessary, it’s more preventative maintenance, but it’s probably a good idea,” says Kocsis. The manufacturer, Olofsfors, does not recommend hard surfacing the ECO-Wheel Tracks, though. They suggest replacing the cleats when they wear down. They do not have any hard data on what the skidder is delivering now vs. when it had chains, but Kocsis says it has resulted in a “serious improvement, probably in the range of 30 per cent”. They had to rebuild the ESCO grapple on the 525. 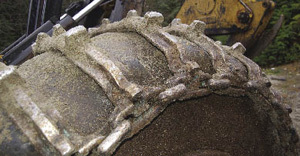 Laughlin noted that would have been necessary regardless, but the wear on the grapple was probably accelerated by the increased productivity of the machine. These are the kind of problems any logger can live with. All in all, Laughlin and Kocsis say the ECO-Wheel Tracks has exceeded their expectations. “We did the research and then took a leap of faith—and it’s paid off,” says Laughlin.